Many of Evolution Racewerks' competitors use a silicone hose connection for the throttle body connection. It is not designed for a silicone hose connection which is used by all the other brand diverter valve pipe upgrades in the market. The throttle body lip is too short and there are no "beads" to prevent the silicone hose from blowing off under boost. Even though it is the easiest way to "rig" together, it is not ideal. The best way to connect the new diverter valve pipe to the throttle body is to replicate the same connection which Evolution Racewerks did. Evolution Racewerks spent a lot of resources developing and manufacturing this factory style connection for this reason. Turn up the boost with a tune and find your $400 factory charge pipe break apart? Fear not! The solution is here! Replace it with a higher flowing, stronger aluminum charge pipe! Made 100% of 6061 high grade aluminum, this will never happen again (backed by Evolution Racewerks' Limited Lifetime Warranty) ! Often ignored, charged intake airflow characteristics greatly affect throttle response, turbo lag and ultimately maximum power potential. Smooth bends and minimal obstructions are ideal. 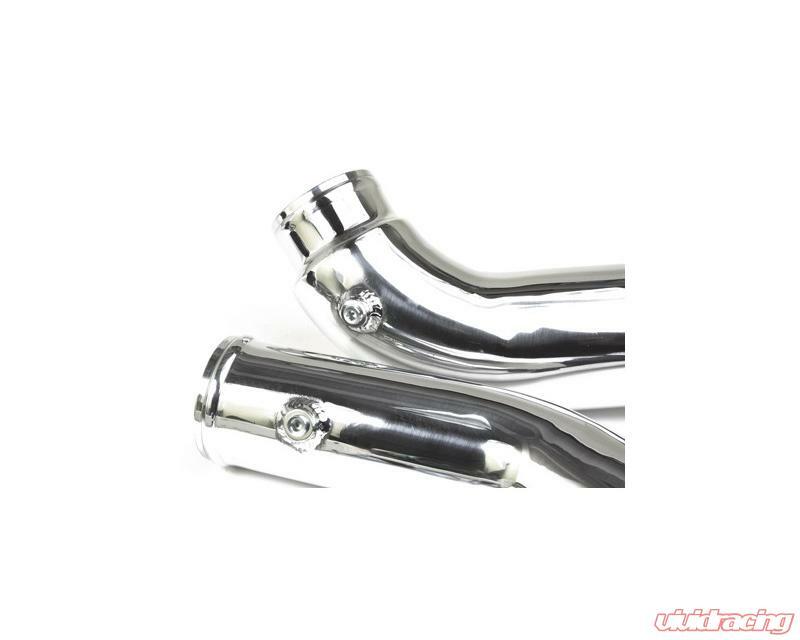 Evolution Racewerks used 6061 aluminum (lightweight) mandrel bent piping to ensure smooth transitions. The upper pipe features 3" piping to match up to the factory throttle body (factory pipe is 2.5"), ensuring maximum flow without obstruction. Evolution Racewerks were the first manufacturer to duplicate the factory throttle body flange with Evolution Racewerks' N54 charge pipe. Evolution Racewerks bring the same thing to the N55 charge pipe. During Evolution Racewerks' research and development, the connection at the throttle body was looked over very carefully. The factory charge pipe is connected to the throttle body using an o-ring inside the throttle body flange which is locked in place by a c-clip, which works very well. It also make removal/installation quick and easy. Evolution Racewerks testing had shown it could hold quite a bit of boost. During Evolution Racewerks' testing, Evolution Racewerks had pressure tested this connection up to 25 PSI. The reason why Evolution Racewerks stopped at 25 PSI was because at 25 PSI, one of the intake pipes on the turbo blew off and Evolution Racewerks could not test any higher. Hoewver, Evolution Racewerks were confident that it would easily hold over 25 PSI as the throttle body flange showed no signs of failing. Also, keep in mind, this type of connection is used throughout the engine, in many crutial areas like the coolant radiator system as well as the clutch system. If BMW did not believe in the durability of this type of connection, they would not use it in such important areas. The same issue came with the MAP sensor. The MAP sensor seals to the factory diverter valve pipe via a o-ring on the sensor itself. Having a hole in a silicone hose will definitely cause a boost leak as it will not properly seal. Therefore, again Evolution Racewerks CNC machined Evolution Racewerks' own replica MAP sensor flange that utilizes the same factory o-ring seal. 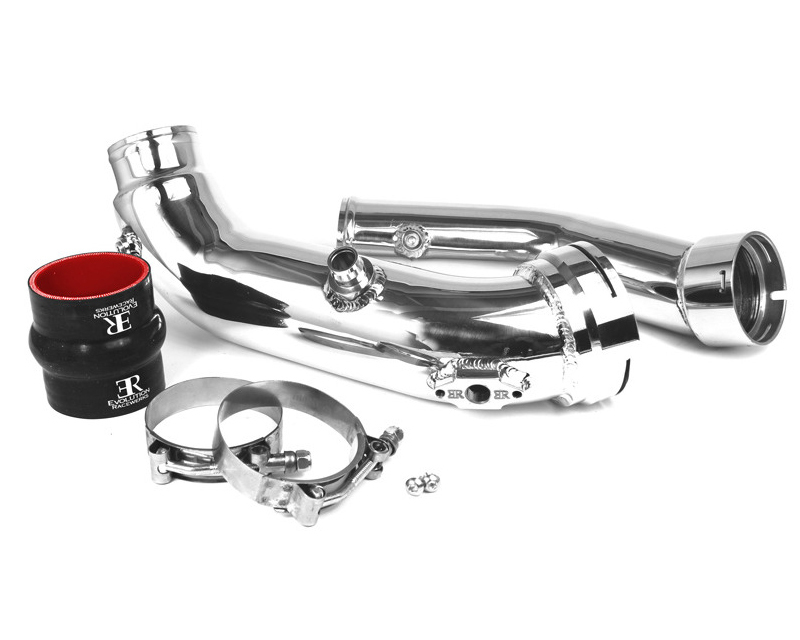 The charge pipe kit for the F30 N55 engine features two charge pipes, the upper and lower charge pipes. Both charge pipes are included in the kit and are required for installation. Retains factory style o-ring throttle body lock flange. Precision CNC machined throttle body flange ensures leak free connection to throttle body. Quick and easy connection and disconnection to throttle body. Ideal connection compared to the silicone hose and hose clamp connection found in all other aftermarket charge pipe upgrades available in the marketplace. Charge Pipe features beaded ends and T-bolt clamps to prevent intercooler piping from coming off from boost. Compatible with the factory electronic diverter valve. This product is intended for OFF ROAD USE ONLY. Not legal for use on pollution controlled vechiles upon public highways.